I’m trying to be a bit healthier at the moment, which basically means no crisps, no biscuits and more running! These are super quick and super easy. They come close to hitting the spot when you need something to go with your mid afternoon cuppa too. And take the chocolate and pistachios off the top and they’re really healthy, just not as pretty! Put the dates, cocoa, oats, coconut oil, hazelnuts and peanuts in a food processor and blitz until smooth. You’ll probably need to add some water too - I put in 4 tbsp. Tip onto greaseproof paper on a baking tray and squash down to about 2cm thick. 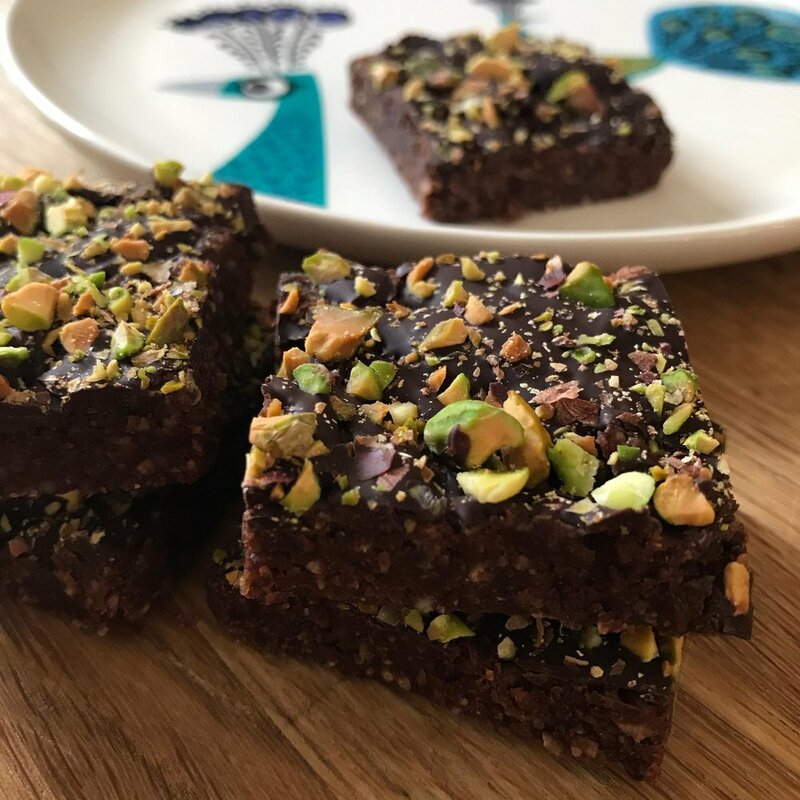 Melt the chocolate and drizzle over, then sprinkle chopped pistachios on top. Cut into squares when the chocolate has cooled. We’re really busy with work and decorating at the moment, so we’re all about easy midweek dinners. This is perfect - chop it all up, put it in the oven (giving you half an hour to wash your brushes! ), then add some goats cheese and eat - what’s not to love. I’m reliably informed it tastes great with leftover roast meat from the weekend too! Put all the chopped veg into a large roasting tin, drizzle with olive oil and add rock salt and pepper. Toss to coat it all with the oil and roast for 30 minutes. Stir in the beans and a good glug of balsamic vinegar and cook for another 5 minutes. Crumble the goat’s cheese on top, drizzle over a bit of extra virgin olive oil and balsamic vinegar and add some basil leaves. We have it with rice or a big hunk of fresh bread. It’s great with leftover roast meat too. What better way to celebrate the end of January than with chocolate! This mousse wins full points for an end of week treat. Don't be put off by having to separate the eggs - it’s still simple and quick. Serve it with Nairn’s Biscuit Breaks for an easy gluten free pudding! Warm the cream a little, add to the chocolate mixture and stir well. Whisk the egg whites to stiff peaks and slowly add the sugar. Mix one spoonful into the chocolate mixture, stirring well, then fold in the rest.